The Hudson River is one of the most well-known and visually splendid waterways in the entire US. Running for 315 miles in total through both New York and New Jersey, the river begins in the Adirondack Mountains of northern New York before eventually draining out into the Atlantic Ocean at the New York Harbor. The river is used a border between various counties around the state of New York and was named after Henry Hudson, an English explorer who first voyaged along the waters of the river in the early 17th century. Having played a vital role in the development of New York City and the state of New York as a whole, the Hudson has many stories to tell and remains one of New York's most popular natural tourist attractions, highly suitable for activities like kayaking. The Hudson offers mostly calm waters, making it highly suitable for inexperienced kayakers, and flows alongside a wide variety of landscapes, including forests, valleys, and even the famous Manhattan skyline. Countless kayakers take to the waters of the Hudson all year long and this river is undoubtedly New York’s premier kayaking location. Since the Hudson is such a popular river for outdoor activities like kayaking, many different kayaking outfitters and companies can be found along its banks, all the way through New York. Whether you’re looking to do some rural kayaking along the river’s greener sections or some urban kayaking exploration in the Big Apple itself, you’ll find plenty of friendly kayaking experts just waiting to lend a hand. These kayaking companies provide rentals, tours, and additional services to ensure that your Hudson River kayaking sessions are as fun-filled and stress-free as possible. With an ever-changing schedule over the course of the year, Hudson River Expeditions runs an array of varied and vibrant kayaking tours, as well as great value kayak rentals for people who simply want to grab some kayaks and take to the Hudson without the need for any guides or schedules. The Hudson kayaking tours with this company are very highly rated and offer excellent value for money, exploring areas like Cold Spring and Peekskill in the Hudson Highlands. Hudson River Recreation offers every kind of kayaking service you could ask for, including rentals, sales, tours, and lessons. Kayaking lessons can be a great introduction for beginners and the Hudson provides the perfect calm water setting for your first ever paddle. Tours include areas like Rye Beach, Croton Point, and Sleepy Hollow, with picturesque views in every direction and fascinating historical and wildlife information provided by the tour guides. With years of experience behind them, Storm King Adventure Tours is one of the best rated and most experienced kayak tour operators along the Hudson River. Situated in a really picturesque spot of the Hudson Valley with the imposing Storm King Mountain towering above, these tours and kayak experiences can last for just a few hours or a full weekend and are suitable for all ability and experience levels. The highly trained guides put a big focus on both safety and fun and work hard to ensure that every participant feels at ease in their kayak in order to have the best time possible. For those who want to do some urban kayaking, there's no better location than the biggest and most famous city of them all: New York City. 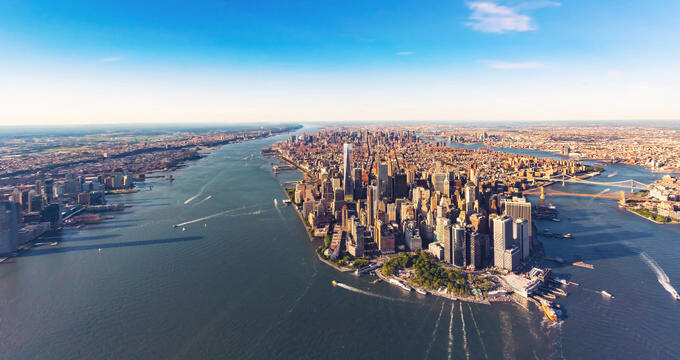 Kayaking in Manhattan is simply amazing and offers an incredible new way to see that breathtaking skyline of skyscrapers and bridges that we all know so well from its multiple appearances in movies, TV shows, and more. Kayaking trips, lessons, and rentals are available from this kayaking company and there’s no better way to enjoy the Big Apple. At the complete opposite end of the spectrum, far from the lights and sounds of New York City, Atlantic Kayak Tours lets you enjoy the softer, more subdued side of the Hudson River. Located upstate, this company provides a range of Hudson River kayaking tours and has been consistently ranked as one of the best outfitters on the whole river. Beginner tours are available as well as more intermediate and advanced options for kayakers who want to test their skills on one of America's most famous rivers.